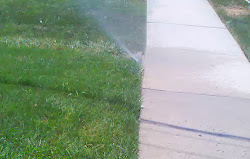 Even on days with very little wind, water from an in-ground sprinkler system can blow where you don't want it because the fine spray nozzles on traditional popup sprinklers create a lot of mist that is easily displaced by the slightest breeze. There's a quick and easy way to fix this! When a large amount of water goes on your concrete instead of your grass you'll need to run your sprinklers longer to make sure your lawn gets the water it needs. Not only is this bad for the environment, especially if you live in an area prone to drought, but it increase your water bill as well. There is an affordable solution that will reduce misting and overspray of your existing system and it's very simple to install. It only involves replacing your sprinkler nozzles. The new nozzles will give you a more even watering pattern, reduce your water usage and minimize overspray and misting. The MP Rotator nozzles are a fairly new innovation created by Walla Walls which was purchased by Hunter. Instead of broadcasting a fine mist spray they work like mini rotor sprinklers with multiple rotating streams. The larger droplet size is more resistant to wind which prevents the water from being blown away so more of it winds up on your lawn where you want it instead of your driveway and sidewalks where you don't. The Hunter MP Rotator nozzles also have a lower precipitation rate compared to the old style spray nozzles. They put down about 1/3rd as much water which will allow the water to be absorbed by your soil and prevent runoff. You'll need to water your lawn about twice as long as you previously with spray heads but you're still saving 1/3rd the water. The Hunter Mp Rotator Adjusting Tool makes it easy to adjust the radius and arc of your MP Rotator nozzles. The bright orange colors makes it easy to spot if you drop it in the grass. These are hard to find locally but Amazon has free shipping on it if you need one. They don't come with the nozzles. Spray heads come in fixed angles such as 90, 180, 270, 360. The MP Rotators have adjustable arcs which allow you to fine tune your angles to prevent putting water where you don't want it. Three different arc ranges are available, 45-105, 90-210, 210-270 and 360 degrees. Adjustments are made by turning a ring around the nozzle using the adjusting tool. The radius can also be reduced on the MP Rotator nozzles so that you can adjust the spray pattern so it only applies water where you want. The radius is adjusted by turning a screw on the top of the nozzle while the nozzle is running. You can use a very small screwdriver or the MP Adjusting Tool. The MP in MP Rotator stands for matched precipitation which means no matter what arc angle or radius you set the precipitation rate will be roughly the same. Watch this video comparing the old Toro Spray nozzles and the new Hunter MP Rotator nozzles. Both shots were taken within minutes of each other. The reduction in overspray and mist is very dramatic. It was a very sunny day and the streams could only be picked up by my camera when close up. Before replacing the nozzles water was puddling on the sidewalk and driveway. Afterwards there was very little water on the sidewalk and most of it was due to not positioning one of the nozzles correctly. This part of the yard is right next to the neighbors. With the old nozzles we'd be watering the neighbor's yard too! The only draw back is that you'll need to reprogram your controller to water twice as long. You'll probably want to monitor the results and make adjustments up or down depending on how your lawn reacts but even though you'll be watering longer, you'll be using less water overall and not wasting water on your hardscape. 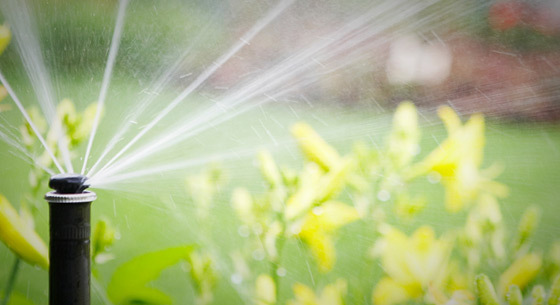 Another benefit of the low flow is that if something changed in your neighborhood that reduced the flow rate of your water system, either due to changes in the mains, or additional development in your area, replacing your existing nozzles with MP Rotators will make your system run like new again. The MP Rotator nozzles are available in either a male or female threaded version to fit different style popup sprinklers. Female threaded MP Rotators will fit Hunter, Rain Bird, Nelson, Irritrol and Whethermatic sprinkler bodies. Male threaded MP Rotatos will fit Toro popup bodies. One of the heads in the test system was an Orbit sprinkler body that had a brass, male threaded nozzle. The MP rotator was too narrow to fit into this nozzle unfortunately. If you have these types of sprinkler bodies and want to use the MP Rotator you'll need to dig them out and replace them with something like the Hunter Pro Spray Body 4" which takes the female threaded nozzles. The MP Rotators come in different models. They are hard to find locally but a wide assortment can be found for a good price on Amazon. MP1000 has a radius range of 8'-15'. All models, MP1000, MP2000 and MP3000 are available in 90-210, 210-270 and 360 degree arcs. The MP rotator series also includes a few specialty nozzles. MPCORNER for tight spaces has an adjustable arc of 45-105 degrees with an adjustable radius of 8' to 15'. Side Strip: MPSS530 creates a rectangular spray pattern of 5' x 30' with the spray head in the middle of one of the long sides. The MPLCS515 and MPRCS515 are left and right corner strips that produces a 5'x15' spray.